FORT WORTH, Texas – With five drivers vying for three spots in NSACAR’s first Camping World Truck Series Chase, expect the intensity to ratchet-up Friday night at Texas Motor Speedway. 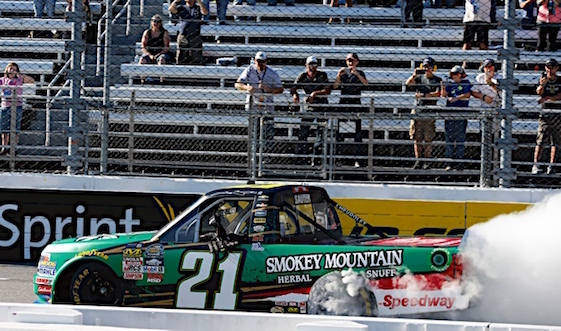 Series veteran Johnny Sauter secured the first berth in the Championship 4 race slated for Homestead-Miami Speedway on Nov. 18 with his victory last Saturday at Martinsville Speedway. Sauter, driver of the No. 21 Chevy fielded by Maurice Gallagher Jr., is trailed on the Chase Grid by Christopher Bell (13 points above two-time series champion Matt Crafton on the cutoff line), Timothy Peters (+12), William Byron (+9), Crafton (-9) and Ben Kennedy (-10). “Funny you bring that (intensity) up because even me, running that race at Martinsville with 20 to go…the last couple weeks the races have been night and day better,” said Bell, who drove the No. 4 Toyota fielded by Kyle Busch Motorsports to a fourth-place finish on the paperclip-shaped half-mile. “I feel like drivers are racing with more respect because at the beginning of the year we could not run a race without getting a green/white/checkered finish. It made me especially happy because I was running fourth the last 15-20 laps so I did not want to see a yellow. So it’s cool to be able to go to these places and finish races on green flag stints. Kennedy finished 18th after late-race contact with Ben Rhodes with 23 laps remaining. Kennedy’s No. 33 Chevrolet spun in Turn 2 and then was whacked by John Wes Townley’s truck. Kennedy said the heated words exchanged between himself and Rhodes post-race were “very quickly” forgotten. “When I woke up the next morning, just had to move on and hopefully get our ticket to Homestead,” Kennedy said during a joint press session with Bell Thursday afternoon. “Guess kind of an asterisk on last weekend for us, but I think everyone is racing each other with a little more respect. Everyone has some more experience out there and knowledge and I don’t expect Texas to be too off-the-wall crazy seeing it is a mile-and-a-half. Truck teams are scheduled to qualify and race Friday for an event set for 220.5-miles/147-laps around TMS’ high-banked/1.5-mile quadoval. Television coverage will begin at 7 p.m. (CDT) with the green flag at 7:30 p.m. The race also will be carried on radio by MRN and SiriusXM NASCAR Radio. KBM’s Byron won the Truck Series night race here in June and will attempt to complete the sweep Friday. Crafton (spring 2014 and spring 2015) and Sauter (2012 sweep) are the only other Chase drivers who have won at TMS. Kennedy finished fourth here in June, while Oklahoma native Bell saw his hopes of winning at his “home track” dashed when he missed a shift at the start of the race and terminally damaged the engine of his Tundra. Mark it down as the ultimate rookie miscue. Bell is working on a stellar streak of 10 top-10 finishes during his last 12 races, including no finish worse than sixth in his last six starts. Bell, in fact, has posted the best average finish in the four Chase races run to-date (4.5) to earn the tag of darkhorse. “Definitely,” said Bell, who is paired with crew chief Jerry Baxter. “I think people wrote me off after Martinsville the third race of the year (19th-place result) because I was making mistakes and we just couldn’t finish races. Luckily with this format change…I was actually disappointed with the format change because I felt like being with Kyle Busch Motorsports we would be able to win the championship or at least compete for the championship straight-up. But looking back at it now, I’m really quite grateful for the format change because it has kept my hopes alive. Persistent rainy conditions Thursday prompted NASCAR officials to cancel both scheduled practice sessions for the Camping World Truck Series race. A single, one-hour practice session has been booked for 8:30 a.m. (CDT) Friday around TMS’ high-banked/1.5-mile quadoval. The added session will not affect the remainder of the day’s busy schedule which also features Truck Series qualifying at 2:45 p.m. In addition to the Truck Series, a Sprint Cup Series practice and qualifying for Sunday’s scheduled for Friday, along with two Xfinity Series practices. That series will qualify and contest the O’Reilly Auto Parts Challenge on Saturday. Due to a non-racing-related injury to his left ankle, John Wes Townley will sit out Friday night’s Truck Series race at TMS and turn driving duties of the No. 05 Chevrolet over to Cody Coughlin.